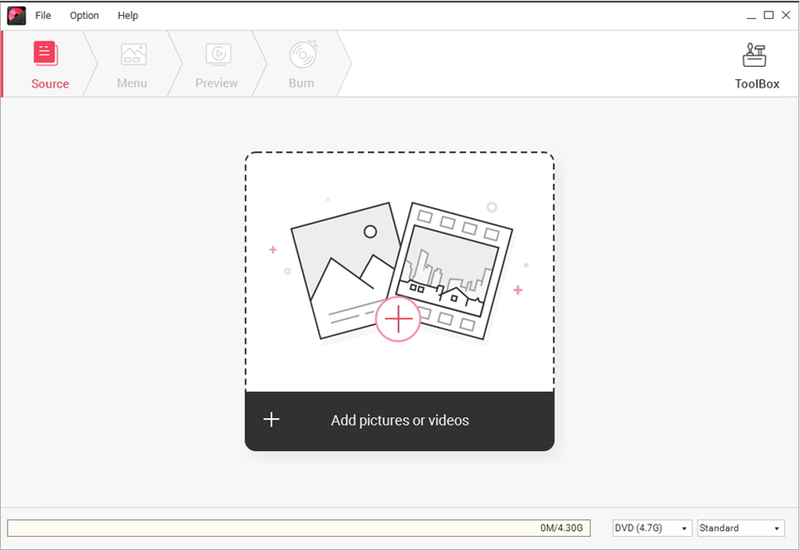 Built-in editor to personalize pictures. 3 Sound Effects to customize background music. It is quite a fun to add some interesting background music to your slideshows. After all, it will result in an overwhelming effect on a particular occasion. Now let us learn how to add background music to the slideshows based on different occasions. Slideshows with background music increases viewing experience. Background music creates interest to watch the slideshows. Speaking of the best software to add background music for photo slideshow, Wondershare DVD Creator undoubtedly comes first. 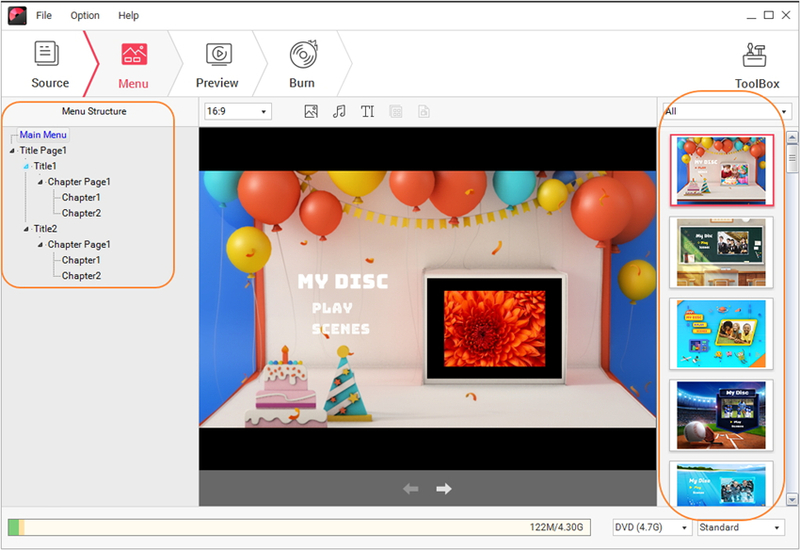 It not only supports batch adding photos for DVD burning, but customize your photo slideshow by providing various editing features like add transition time, set photo duration, etc. 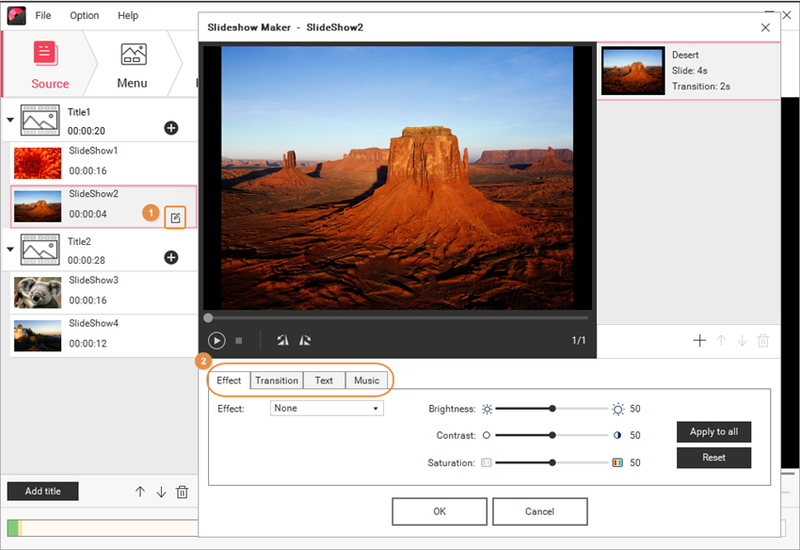 In short, you'll be amazed to know how Wondershare DVD Creator simplifies the process of adding background music for slideshow once you start following the steps below. Create photo slideshow and burn into DVD/Blu-ray disc with ultimate background music. Support most popular image formats include .bmp, .jpg, .jpeg, .png, .gif, .tif, etc. Combine any music you like with photos and burn to DVD for precious memories. Edit pictures easily with effects, transitions, text, and music. Choose slideshow DVD menu templates from 100+ free template designs with Travel, Nature, Sports and other themes. Customize slideshow menu by changing background image, adding title or thumbnail, creating chapters and more. Built-in toolbox to realize functions of Slideshow Maker, ISO to DVD, Data Disc, Video Editor, One-click to Blu-ray Disc, etc. 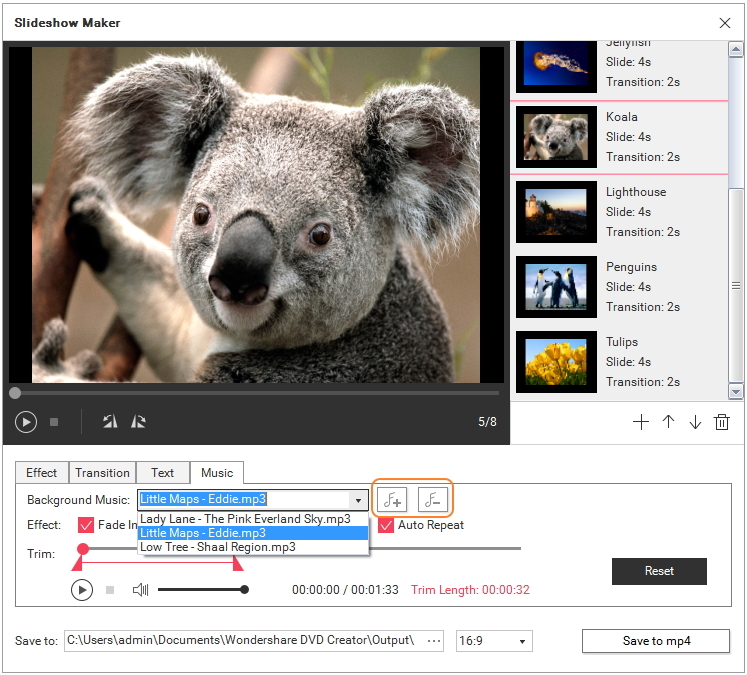 Run Wondershare DVD Creator on your PC and select the option Create a DVD Video Disc from the window. Click the + icon under the Source tab to browse and add image files from your PC, or directly drag and drop your desired photos to the program. All added pictures will be shown as thumbnails on the left column, click + button to add more images to the title. If you want to add more titles, just click Add title from the bottom left and select images to proceed. Click on icon on the thumbnail and a new dialog box will appear with editing options, where you can rotate photos, apply effect, add text, adjust photo transition settings. Click the Music tab and select your desired music by clicking the music icon just as the screenshot shows. Once the music get uploaded, you can view your slides with music by hitting the Play button. You can also apply Fade in, Fade out or Auto Repeat to the background music at will. Trim the length of the music is also supported. Go to the Menu tab to choose a template design from the right column. You can select the favorite one from Memory to Movie style. Click the icons at top of the interface to make further customization, you can change background picture, add text, adjust thumbnail, create chapters, and others. 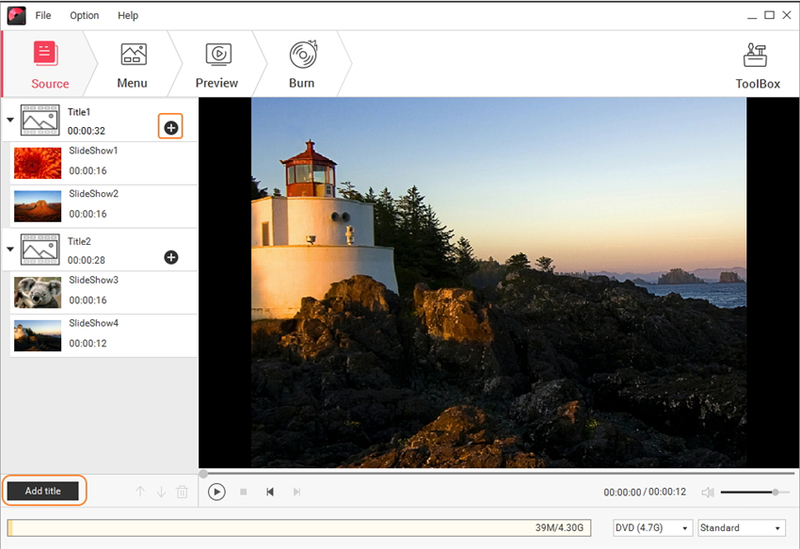 Go to the Preview tab to check your DVD photo slideshow from the ground up. Move to the Source tab or Menu tab to make adjustments if you're not satisfied. Proceed to the Burn tab, complete the DVD output settings based on your need and click Burn to start transferring photos to DVD. Here is a list of our recommended wedding songs, graduation songs and some songs for birthday slideshow. Here are some of the best wedding slideshow songs. Stay With You by John Legend - "We've been together for a while now / We're growing stronger every day now"
Halo by Beyonce - "Remember those walls I built / Well, baby, they're tumbling down"
Forever by Ben Harper - "Forever always seems / To be around when it begins"
Let's Stay Together by Al Green - "Forever always seems / To be around when it begins"
Mushaboom by Feist - "I've got a man to stick it out / and make a home from a rented house oh oh-oh"
Anniversary Song by Cowboy Junkies - "Have you ever seen a sight as beautiful / As that of the rain-soaked purple"
The Luckiest by Ben Folds - "I don't get many things right the first time / In fact, I am told that a lot"
Love Song by Miranda Lambert - "I was standing there crying in the kitchen / It's been one of those mornings that's gonna last all day"
Truly Madly Deeply by Savage Garden - "I'll be your dream / I'll be your wish / I'll be your fantasy / I'll be your hope / I'll be your love / be everything that you need"
Maybe I'm Amazed by Paul McCartney - "Maybe I'm amazed at the way you love me all the time / Maybe I'm afraid of the way I love you"
The Wedding Song by Bob Dylan - "I love you more than ever / more than time and more than love / I love you more than money and more than the stars above"
Keep On Lovin' You by Reba McEntire - "Love takes the patience of Job / That's what my Mama always said"
So Amazing by Luther Vandross - "Love has truly been good to me / Not even one sad day / Or minute have I had / Since you've come my way"
Point of It All by Anthony Hamilton - "My days seem long whenever we're apart / It's like someone had thrown away my heart"
Love of My Life by Brian McKnight - "Everything I did before you, wasn't worth my while / It should've been you all the time / I'll do anything"
Share My Life by Kem - "Listen, I want you right here in my world / Here in my life, here in my soul / I want the world to know that I need you"
Dangerously in Love 2 by Beyonce - "I am in love with you / You set me free / I can't do this thing / Called life without you here with me / Cause I'm dangerously in love with you / I'll never leave"
Fall For You by Leela James - "My heart is ready / For love and to be loved / And I chose you, baby / That's the one thing I'm sure of / So I will take this one last step"
Make Me Whole by Amel Larrieux - "Cause your eyes are the windows to heaven / Your smile could heal a million souls / Your love completes my existence"
Why I Love You by MAJOR - "I found love in you / Every moment that you smile chases all of the pain away / Forever and a while in my heart is where you'll stay"
Let us find out some of the best graduation songs for slideshow. Graduation (Friends Forever) by By Vitamin C - "And so we talked all night about the rest of our lives / Where we're gonna be when we turn twenty-five / I keep thinking times will never change"
Seasons of Love by Rent Film Cast - "It's time now to sing out / Tho' the story never ends / Let's celebrate / Remember a year in the life of friends"
The Climb by Miley Cyrus - "There's always gonna be another mountain / I'm always gonna wanna make it move / Always gonna be an uphill battle"
We Are Young by Fun And Janelie Monae - "Tonight / We are young / So let's set the world on fire / We can burn brighter / Than the sun / Tonight / We are young"
Unwritten by NATASHA BEDINGFIELD - "Staring at the blank page before you / Open up the dirty window / Let the sun illuminate the words that you could not find"
History by One Direction - "You and me got a whole lot of history / We could be the greatest thing that the world has ever seen / You and me got a whole lot of history"
Live Like We're Dying by Kris Allen - "Yeah we gotta start lookin' at the hands of the time we've been given here / This all we got then we gotta start thinkin' it"
Never Grow Up by Taylor Swift - "Oh darling don't you ever grow up, don't you ever grow up / Just stay this little / Oh darling don't you ever grow up"
For Good by Kristin Chenoweth and Idina Menzel - "Who can say if I've been changed for the better / But because I knew you / I have been changed for good"
100 Years by Five for Fighting - "Fifteen there's still time for you / Time to buy and time to lose / Fifteen, there's never a wish better than this"
Goodbye to You by Michelle Branch - "Could I have loved someone like the one I see in you / I remember the good times baby now, and the bad times too"
FIREWORK by Katy Perry - "You just gotta ignite the light / And let it shine / Just own the night / Like the Fourth of July / 'Cause baby you're a firework"
Don't Stop Believing by Journey - "Streetlight people / Don't stop believing / Hold on to the feeling"
Fly by Hilary Duff - "Fly / Open up the part of you that wants to hide away / You can shine / Forget about the reasons why you can in life"
Who Says by Selena Gomez and The Scene - "Who says / Who says you're not perfect / Who says you're not worth it / Who says you're the only one that's hurting"
I Gotta Feeling by The Black Eyed Peas - "Cause I gotta feeling, woohoo / That tonight's gonna be a good night / That tonight's gonna be a good night"
Keep Holding On by Avril Lavigne - "You're not alone / Together we stand / I'll be by your side / You know I'll take your hand / When it gets cold / and it feels like the end / There's no place to go / You know I won't give in / No, I won't give in"
Life is a Highway by Rascal Flatts - "We won't hesitate / To break down the garden gate / There's not much time left today / Life is a highway / I wanna ride it all night long"
Hero by Mariah Carey - "There's a hero / If you look inside your heart / You don't have to be afraid / Of what you are / There's an answer"
Time after Time by Cyndi Lauper - "If you're lost you can look and you will find me / Time after time / If you fall I will catch you — I'll be waiting / Time after time"
And below lists a few of the best songs for birthday slideshow. Happy Birthday by Carly Simon - "We've given up caffeine and sworn off desserts / I don't try to seduce you, we don't even flirt / We're too good to be happy, too straight to be sad / So just blow out the candles"
Happy Birthday by Stevie Wonder - "Because it should never be / Just because some cannot see / The dream as clear as he / that they should make it become an illusion"
Birthday by the bird and the bee - "Who knows your birthday? / Who knows your number? / Who knows your color? / Who knows your hands? / Who knows the sum of all your parts?" It's My Party by Lesley Gore - "Judy and Johnny just walked through the door / Like a queen with her king / Oh what a birthday surprise / Judy's wearin' his ring"
Tears at the Birthday Party by Elvis Costello & Burt Bacharach - "But now I see / I see you share your cake with him / Unwrapping presents that I should have sent / What can I do?" Birthday by Katy Perry - "But when you're with me / I'll give you a taste / Make it like your birthday every day"
Birthday Happy by Robby Armstrong - "Happy birthday baby / My friends do rock and roll / Birthday happy, yeah that's me / Tonight I'm shining like gold"
Birthday Cake by Rihanna - "Cake / Cake / Cake / Cake / Cake / Cake / Cake / Cake…"
Six Feet Under by No Doubt - "Today is my birthday / And I get one every year / And someday… / Hard to believe / But I'll be buried six feet underground"
Happy Birthday by The Ting Tings - "If they were me and I was you / Would you like a present too?" Birthday by Destiny's Child - "I'm sendin’ out invitations / To let all your friends know that (it's your birthday) / But all that I really wanna do / Is wrap you up and get in the groove"
Birthday Girl by Matt Nathanson - "C'mon and lift the fog, my birthday girl / The rains came, turned all the hills green / Turned the dirt to flowers, birthday girl"
Love Ridden by Fiona Apple - "Love ridden, I will look at you / With the focus I gave to my birthday candles / I've wished on the lidded blue flames under your brow / And baby, I wished for you"
Happy Birthday Girl by Sondre Lerche - "And while I'm barking at the moon / You sing your heart out to a tune / Hoping you'll never grow old"
In da Club by 50 Cent - "I'm that cat by the bar toasting to the good life / Moved out the hood now you trying to pull me back, right / When my joint get to pumping in the club, it's on / I wink my eye at your chick, if she smiles, she gone"
Your Song by Elton John - "It's a little bit funny this feeling inside / I'm not one of those who can easily hide"
Never Grow Up by Taylor Swift - "Your little hand's wrapped around my finger / And it's so quiet in the world tonight"
Here's to Never Growing Up by Avril Lavigne - "Singing Radiohead at the top of our lungs / With the boom box blaring as we're falling in love"
Happy Birthday to You by New Kids On the Block - "This day only comes once every year, because you're so wonderful / With each and everything you do"
Happy Birthday by Click Five - "Hey you, I know I'm in the wrong / Time flies, when you're having fun / You wake up / Another year is gone"
Nothing can be more exciting than watching your memorable slides with occasion suited music that will make your memories alive. No matter where you are, your music collection will always be there to bring a smile to your face as well to loved ones. Hope you enjoyed reading the article and learned well how music can be added for a photo slideshow.